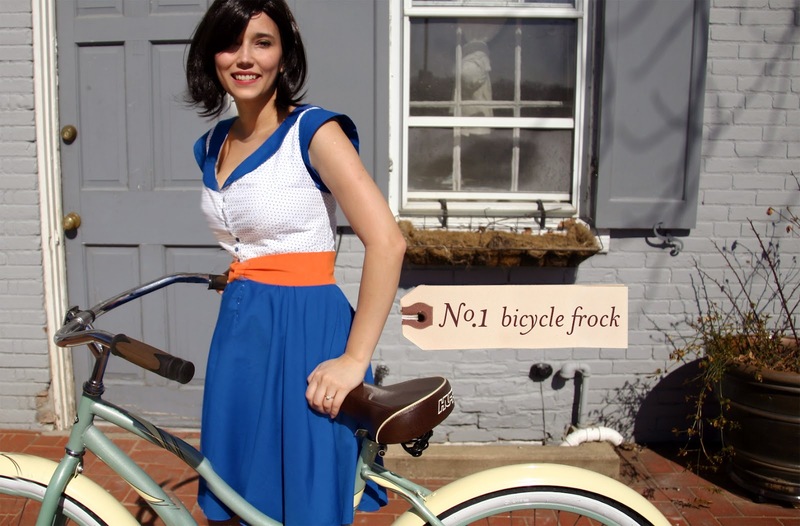 Grosgrain: Bicycle Frock Grosgrain Giveaway! Oh I'm finally doing another giveaway. It's been too long. Henri's kept me quite busy. Out of all my children, he's been the most fussy. Poor baby. I think he might have stomach aches. 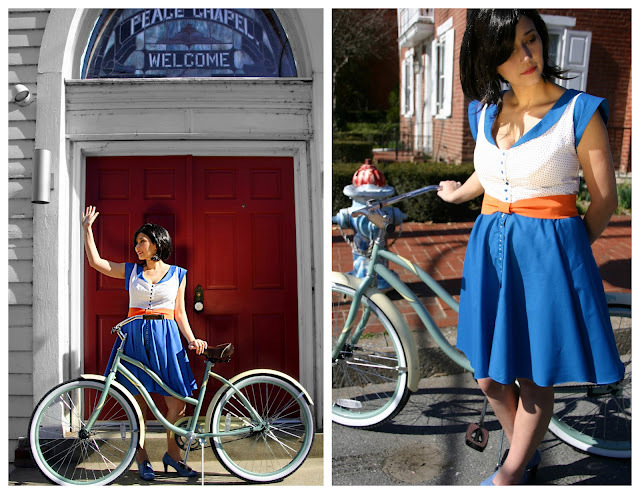 I modeled this dress after the Crystalline Sky Modcloth Dress that I loved. The sleeves, the neckline, the buttondown front, the empire waist. I made the v-neck a little higher since I don't like low Vs. If I had a smaller bust I might feel differently. I then added a bow belt made of ultra suede fabric, used a blue swiss dot for the bodice and royal blue for the bottom and sleeves. The measurements of this frock are 33 waist, 34 from shoulder to hem. The belt will cinch the dress a bit. And the waist isn't the true waist but more of an empire waist. I'll also have a special surprise after the winner is announced! 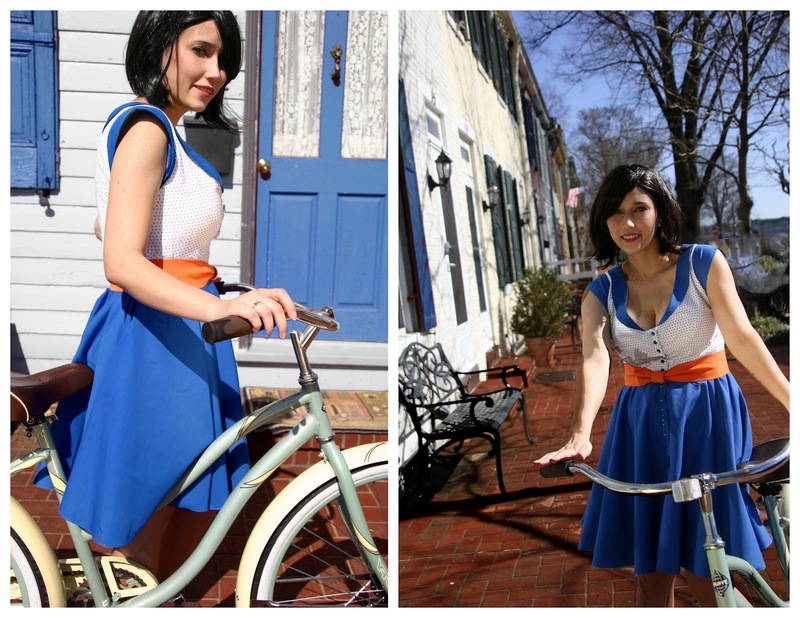 We took these pics yesterday and the weather was almost just right for an outdoor shoot. It could have been maybe 5 or 10 degrees warmer but it was still fantastic for early March and I get cold in 70 degree weather. 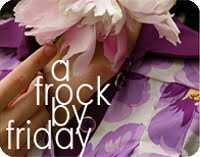 As I mentioned, I have a surprise for everyone once the winner for this frock is announced. I think it will be something anyone who like this piece will enjoy! 2) By Following Grosgrain using RSS or Google Friend Connect. RSS is located in MY UPPER LEFT SIDEBAR. Google Friend Connect is located at the bottom of this page. 3) Like this post on Facebook. I tweeted a link on https://twitter.com/#!/Corvustristis I've followed your RSS feed via Google Reader for ages. And I absolutely ADORE this dress! How beautiful! 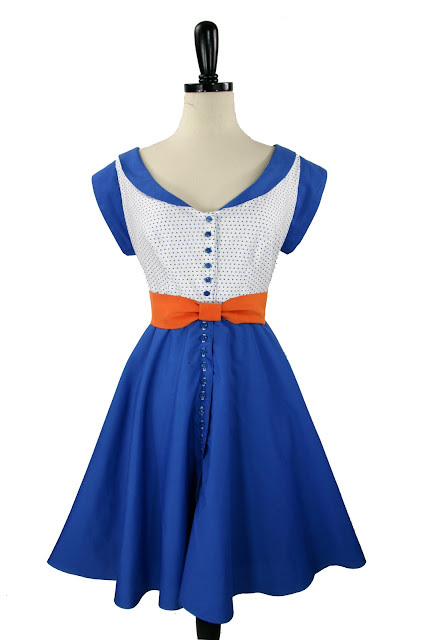 The dress is also in gator colors (Univ of FL), which would be totally perfect. I "liked" you on Facebook, and already I follow you in my Google reader. I'm following you! Thanks so much! I'm following you! I hope I win. That dress is adorable! I tweeted about the giveaway! Thanks for the giveaway! I follow your RSS feed too! (1) I Follow you on Google Friend Connect. Cute dress! I pinned it and linked to it on my FB page. I'm already following you via Google Reader. I follow on blogger and pinned it. what a darling dress! i follow via GFC, and i'd loveloveLOVE to win. I love this dress! I follow you with Google Friend Connect. ooh it's so lovely! I have to take part in! I liked it on facebook and pinned it to my pinterest boards. Love this!! Liked on fb. :) PS I think I have a good guess at your surprise. And now I'm following you on Google Friend Connect (as well as on Bloglovin). aww! I'd love this. thanks for the giveaway! i follow you via GFC. Thanks again! I already follow your blog but I posted to FB! What a cute dress! I'd love to win though I'll have to wait till after I have my baby to fit into it. LOL! I "liked" on facebook and pinned on pinterest. I also am a follower. I liked this on FB and I already follow you via google reader. Love the dress! I liked this on FB, pinned this and I already follow you via google reader. I follow this in Google Reader via RSS and liked it on Facebook. I follow you in Google Reader and I liked this post on FB! SUCH a gorgeous dress-- I LOVE it! Fantastic! My husband would love it on me, too, since it's UF colors. I also follow the blog on RSS. Love this! The spot where you took this pictures is perfect too! I posted it to my pinterest dresses board. 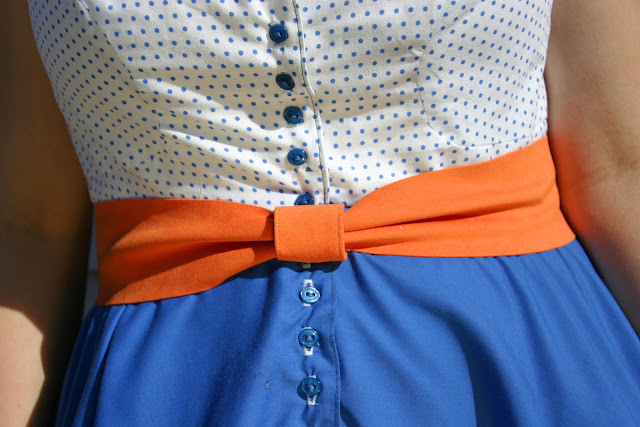 what an adorable dress - the details and color combo are outta this world! Cute dress! 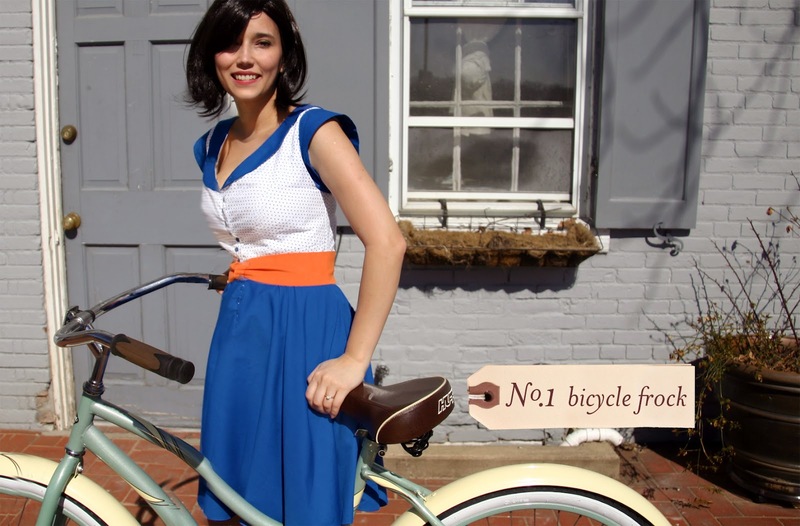 I pinned this dress to my Pintrest boards and follow this blog in my reader. Follow by gfc, stephanie olmsted. 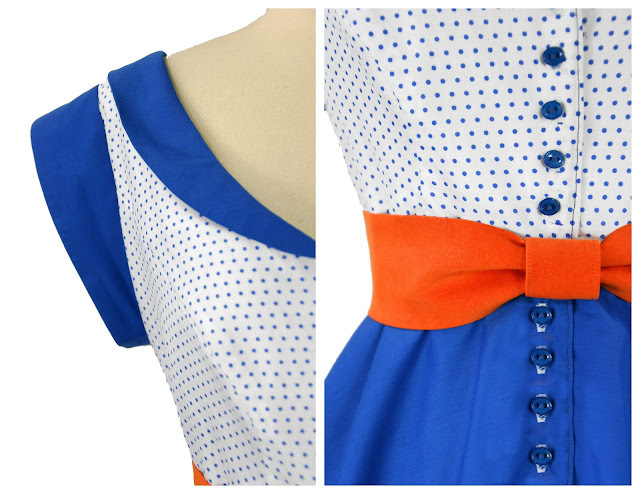 I follow Grosgrain and I love this dress! Ooh I missed seeing your creations! I follow via RSS! Can't believe you made a dress with 4 littles at home! And you look fabulous! I'd love to win :) I follow via RSS. I "pinned" this cute dress! You're so adorable! Sorry that the baby is being fussy. :( My firstborn was colicky and gave us all much grief and heartache... I feel your pain. Love this dress so much! I follow you through my Google Reader. liked on facebook and shared on pinterest! 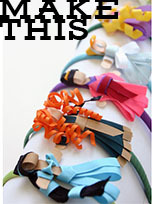 I pinned about this lovely giveaway to Pinterest! I also liked this on Facebook! My, I am envying your weather! It's still very snowy where I live, but I can't wait to have that spring sunshine coming through my windows. You did a wonderful job on the dress! The colors are just lovely. This is so delightful, and cheery too. I'm following ya:-)!!! Every detail on this dress is beautiful!I followed you already on Google Reader! I follow via RSS!! Love your sewing. I have a son named Henry too! Lovely dress! I pinned it! I follow you on greader! So cute! I love the sleeves and neckline. I'm a follower! And I LOVE this dress. LOVE it! Adorable - I don't know how you can give it away when it looks so good on you!! What a beautiful dress! Thanks for the opportunity to win it. I follow via Google Friends. Now liking on facebook too! I liked this on facebook and pinned it as well! I follow RSS and have been a follower of your blog for a long time. I love this dress! And it will fit perfectly! Oh, I also liked on fb. Hi! I tweeted about your adorable dress giveaway! @menoseljenn :D And of course I am following on Google Reader! I started following you with google reader! I love it, it is adorable!! I follow your blog google reader! I also liked this post on Facebook! I follow you on Google! Love your blog. What a lovely dress! I liked your post on Facebook. I follow on Google Friends Connect. I linked your giveaway on my facebook page. I also pinned this lovely frock. Such a super cute dress. Awesome dress! I'm now following you through Google. Plus I liked the post on FB and I pinned you to my pinterest board. http://pinterest.com/pin/281545414174869686/ I can't wait to check out the rest of your blog! I love it! I follow you via google reader. I liked it on Facebook, and I pinned it because I wanted to make sure I got an entry in! I love your remakes. Your dress is darling. It is on my facebook page twice! Cute dress, but I am even more impressed that you look amazing after just having a baby! Facebook and pinterest. This dress is amazing! Love love love!!! Cute and Cute! I follow with GFC. I liked you! :) It's also my new homepage...so great. Thanks for the contest! I've pinned your pretty dress. Good luck with the little fellow. Thanks for the contest! I pinned your pretty dress. I hope your little fellow gets better. I follow you through Google RSS. I'm excited to hear your announcement! I pinned it - so adorable! I follow via Google reader and have had you in my favorites forever. I'm always in awe of your creations! I'm following with Google Reader. Even though I'm not buying any new clothing until after my next birthday, it doesn't mean I wouldn't be happy to win some! I follow your RSS and like this post on my FB. OH my gosh. This dress is To. Die. For. and I would love to have it!! What a wonderful giveaway! Pinned you on my Pinterest Style Board! can't wait for the outcome ! You are so utterly talented! I came by this morning because I saw some pretty dresses on shopruche and thought, hmmm, let me check grosgrain, Kathleen might have a tutorial or tips on making a pretty dress that would cost much less. And I wouldn't have to wear polyester. So glad I came by this morning. I follow with the RSS feed. FUN! I facebook liked you! I "liked" this post on Facebook. Thank you for the giveaway! This dress is fantastic! I follow via GFC! This dress is BEYOND adorable!!! Good luck everyone! I "liked" your post on facebook and pinned it! I follow your blog through google reader. You are so talented! I would love to win that dress! I follow you! 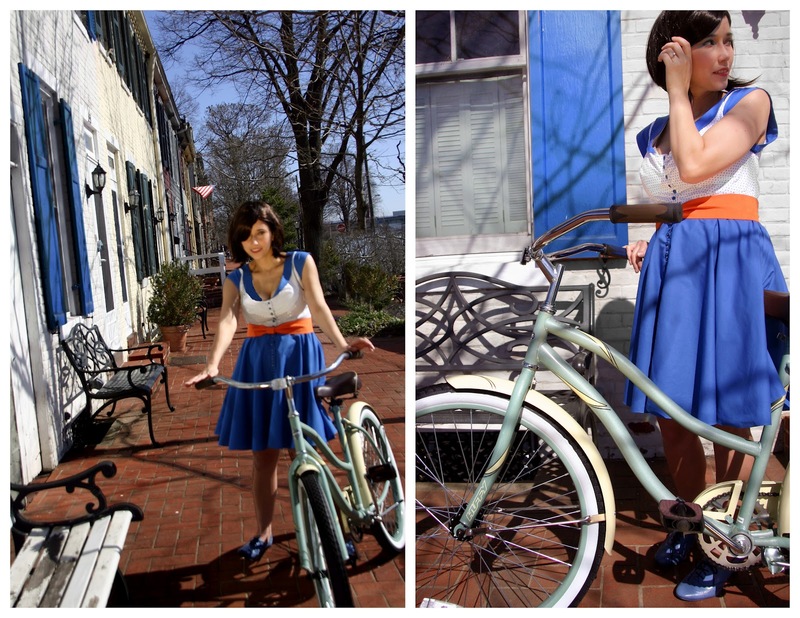 What a crisp, fun dress to start Spring with! I love it! I pinned your dress on Pinterest! I follow your blog for a while now, and i really like your tutorials! I also liked this entry + put a link to it on facebook. I would love to win this beautiful dress!! I'm now following you! I absolutely love this dress-so cute!! I liked this blog post on Facebook! I follow your blog with Google Reader! I follow you and love the dress! hi! I love all your creations! I start following you now via RSS, and I've done all the things that you ask! Pinned on Pinterest and liked on Facebook!Love the dress! Pinned on Pinterest and Liked on Facebook! Love this dress! Wow beautiful dress love this colour combination. I liked on Facebook and am now following you with Google Friend Connect. So pretty! I subscribed via RSS. Hi, I have posted a link on my blog, liked it on Facebook, and I follow you on Blogger. Fabulous dress ~ hope you accept entries from the UK! Oh my gosh, what a dreamy dress! It's just perfection isn't it?! 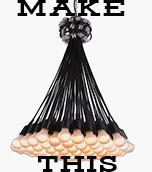 I found my way here via Pinterest, and (great giveaways aside) your blog is a delight! The winner of this pretty is going to be so lucky! The dress is gorgeous! I clicked like on the post and left a comment on facebook and I follow your blog via google!! I'm now following you through RSS! Thanks for the chance to win! It must be a sign! I'm cycling to Amsterdam from London in May to raise funds for the NSPCC. Pinned it! 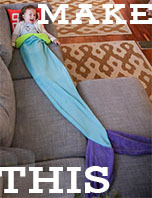 http://pinterest.com/pin/194710383859650885/ so freakin cute! I liked the post on FB. Such a wonderful dress! I posted the giveaway on my blog at: http://growkneadpickleandsew.blogspot.com/ What a great summer dress! I bike to school and work almost every day. Right now I'm tucking my skirts into my rain pants (I live in Seattle), but in the summer I love to let my skirts fly!